This house has been far out at sea is a group exhibition exploring language and the act of story telling. Artists and writers look at the process of story telling and its participatory values. This house has been far out at sea was part of the Glasgow Open House Art Festival, which ran from the 1st to the 4th May, exhibiting artworks across Glasgow in a variety of venues, from flats to industrial spaces. 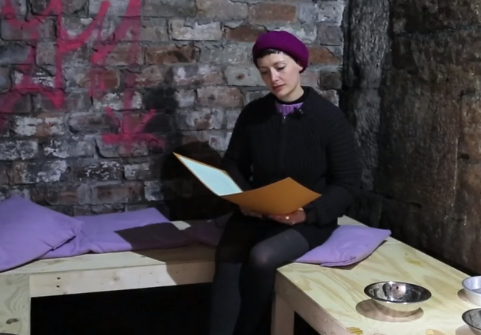 Glasgow Open House is an artist-led, not-for-profit organisation that was founded by Glasgow School of Art alumna Amalie Silvani-Jones in 2013. It was formed in order to meet the practical needs of the city’s grassroots art community and takes its lead from Glasgow’s already prevalent ‘Do-It-Yourself’ culture in relation to visual art and music. Artists featured: Alex Millar, Alison Blunt, Birthe Jorgensen, Catherine Hotchkiss, Cristina Garriga, Emily Ilett, Jasper Coppes, Joanna Monks, Joanna Peace, Kathrine Sowerby, Laura Edbrook, Laura Gonzalez, MY BOOKCASE, Stephanie Burt, Susan Brind and Jim Harold & Tell it Slant.